Vehicle graphics are more popular than ever right now. A well branded company car or truck may be the most visible part of your branding efforts depending on the type of business you operate. 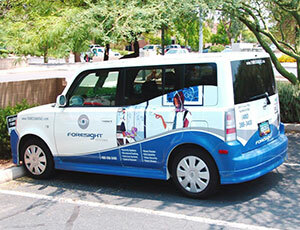 When you wrap your vehicle with your brand you never miss an opportunity to catch that prospect at just the right time. Vehicle have a multiplicity factor that is hard to describe. We have clients with 4 or 5 trucks tell us people think they have 25-30 of them on the road and make comments like "we see your trucks everywhere" all the time. 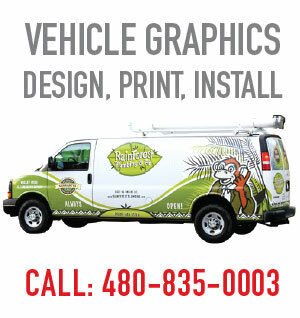 Tower Printing and Graphics has been providing truck wrap and car wrap design to Arizona local brands as well as various national brands for many years. Branding Arizona businesses is what we do best! Before you invest in branding your company vehicles, make sure to give us a call and we can help create a cost-effective solution for you. Full wraps are not generally the most effective way to go. Be sure to visit our LOGO-MALL for other branded promotional merchandise and ad specialty items available, retail location in Mesa Arizona.